Don't miss the case for AI's intellectual property rights and Waffle Houses in the path of solar eclipse totality. Technobabble is our look at the more colorful aspects of technology and the tech industry. Be sure to check out our most recent edition featuring dancing hot dogs and hackable DNA. Unless tech companies find a way to further compress data, storage providers will have to work hard to keep with the demand. Seven of the 10 largest data centers call the U.S. home. Wales, India and China cinched the other three spots, according to Rack Solutions. The #2 placeholder right now — a center in Lanfang, China coming in at a whopping 6.3 million square feet — is set for a demotion to the #3 spot to a surprising location: the Arctic Circle. Kolos, an American-Norwegian data company, has raised several million dollars from private investors to build a one-gigawatt data center in Ballangen, Norway. The new data center would start drawing on 70 MW of power and move up to 1,000 MW within 10 years — a feat that would put the company on par with Amazon’s data center in Ashburn, Virginia. Besides a stunning view of the Northern Lights, Ballangen offers a few key advantages for Kolos. It boasts the lowest power cost in Europe, 100% renewable energy and unlimited supplies of cold water to chill hardware. If you think exotic ice plateaus where your data has polar bears for company isn’t exciting enough, other companies like Cloud Constellation have also rethought data storage. In March, the startup was awarded the patent for a global communications platform and secure storage place at low orbit. The company plans to make data storage in space a reality by 2019. If their vision pans out, space-based data centers could offer petabytes of data storage and transition times under a second. No word yet on the potential cybersecurity measures from terrestrial-bound hackers. The size and security benefits of both data center options could not be coming at a better time. As more companies move toward cloud computing and Big Data, storage providers have the difficult task of figuring out where to put it all. By 2025, humankind is predicted to create 163 zettabytes of data in a given year, according to research group IDG. That’s the equivalent of 1.8 trillion new Kolos data centers. And you thought managing your smartphone storage was hard. We still don’t know if the chicken or the egg came first and this may now be the debate for the intellectual property of artificial intelligence (AI). It’s time to determine which came first — AI’s artwork or the AI’s programmer. AI is becoming so in tune with its own "mind" and adopted creativity that it has made works across several mediums: music, paint, poems and even comedy, according to The New York Times. However, after two pieces of art made by Google’s DeepDream were sold for $8,000, according to The Wall Street Journal, the time has come to examine the intellectual property rights of AI, as suggested by Quartz. Thought generation is an extension of the mind, but AI technically does not possess its own mind. Unless, the mind of AI is the property of its programmer. As seen in the sensitivity of Microsoft’s AI chatbot Tay, bias is not something AI is immune to. Perhaps creative art expression is the same. It may be safe to say that the creations of AI are just modifications or enactments of its programmer’s mind. At the end of the day, the artistic prowess of AI comes down to the algorithms encoded into its software. The argument in this case may not be who is holding the paintbrush but who provided the paintbrush. The $8,000 did go to the pockets of humans claiming ownership. Currently, the U.S. Copyright Office does not accept content made by anything other than humans but those rules may be vague enough to soon be changed. Maybe one day we’ll have an AI reincarnation of Michelangelo. As if geographic location didn’t already hold enough blame for causing millions of Americans to miss out on experiencing 100% of Monday’s solar eclipse, you can now also charge it with unfairly distributing automation robots around the country. A Brookings study found that the Midwest, specifically Michigan, Ohio and Indiana, accounts for nearly 30% of industrial robot usage with just under 68,000 bots. The South boasts the next largest concentration. Geographic distribution of robots largely mirrors the distribution of America’s automated advanced manufacturing centers, according to the study. The especially dense Midwest concentration comes from robots hard at work welding, painting, assembling and packaging minivans and other vehicles new to market. As fears of losing jobs to automation take root among blue collar workers, this map likely shows where anxieties will be highest. The last few decades have seen industrial workers taking some hard economic blows, and the growth of automated production bears some responsibility. While robots may be hailed for streamlining industrial processes and reducing human error and risk, their contribution to the economic malaise in the Midwest and South has larger social impacts. Brookings found correlation between high robot density and political leanings last November: states who went red were more than twice as likely to have high robot density than states who went blue. The solar eclipse crossing the U.S. is right around and the corner, and enthusiasts will begin traveling path of totality this weekend (if they're not already there). Now there's data analysis to show those enthusiasts how to enjoy the eclipse even more. 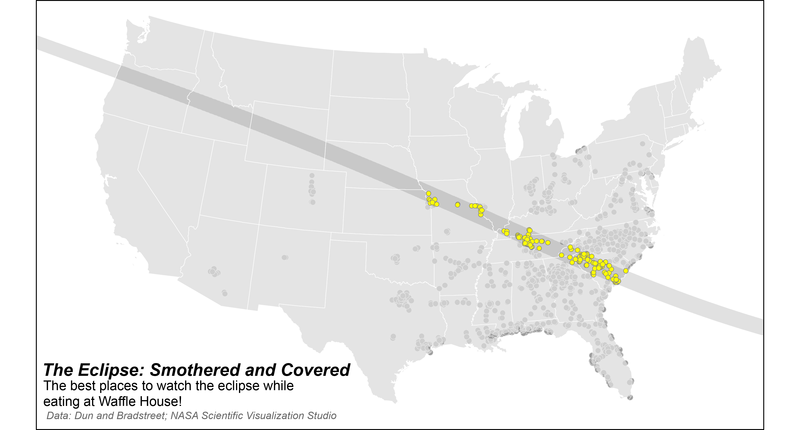 Thanks to a recent map from Jerry Shannon, an assistant professor at the University of Georgia, we now know the best places to watch the eclipse while eating at Waffle House. Looking for the highest concentration of Waffle Houses in a state in the path of totality? Just head down to South Carolina.